Have you ever been too busy to spend time with God? Yeah, me too. It’s not that I don’t want to…I really, truly do. I crave that time with my Bible and the Lord. But as a busy homeschooling mom of 7, I know there is always something to do, always someone who needs something. I know, without a doubt, that if I spend time with God each day, he will bless that time abundantly and help me get through each day. I know it. And yet, sometimes I still don’t do it because it is one more thing on my list. Ouch. I needed something simple to bring my Bible Study to life. I knew I wanted to not only read my Bible and pray every day, but I wanted to dig in deeper and really have scripture sink in. I also wanted to organize my spiritual life in a way that would be life-giving and not overwhelming. I was forgetting that I told people I would pray for them and I was barely skimming the surface of what I was reading. I never want to be too busy that I neglect my time with the Lord, however that might look in this season of life. 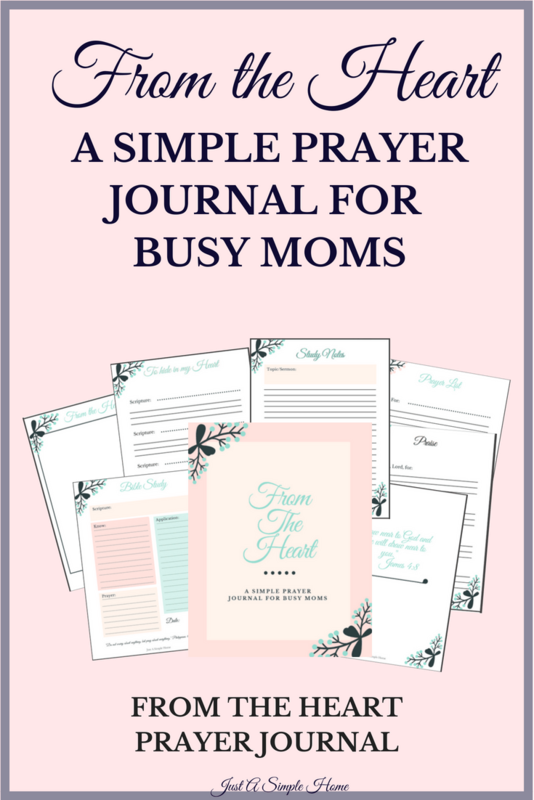 So, I created the From The Heart Prayer Journal to help me and you drink deep from the well, without pressure. I want us to stay focused on what God wants us to learn and the assignments He wants us to complete each day. This may look different for each one of us and may change during seasons in our lives. When I have a new baby and can’t get up early, I read my Bible and use my Journal while I am nursing and the other kids are having quiet time. If I am able to wake before my children, I take advantage of that time and use my Journal then. Sometimes, I may not get to my ‘From The Heart Journal’ until later in the afternoon, and my children do their journaling with me. For the last few months, it has been hard for me to wake up before my children. I have a new baby who gets up through the night, which makes early mornings impossible for me. I still do get up a bit earlier than they do, but I am not getting the long stretch of time I used to. So, I get it in when I can. I usually do start my day reading my Bible. If I am not following a plan, I just pick out a verse that spoke to me or one I want to memorize. I write that verse down on my Daily Bible Study page and then use the rest of that page to write what it means to me, what I want to remember from it, the setting around that verse, and how I want to apply it to my life. I write a simple prayer, specific to what verse I want to apply to my life. I refer back to my Prayer List and write down any answered prayers on the Praise page. Along with my daily verse, I have a list of my favorite verses and look at those daily so I can review and memorize them. Many of these verses relate to being a wife or a mother and some are verses we are memorizing as a family. Although I do have a Journaling Bible, I like to use the blank “From The Heart” pages to illustrate my faith. Occasionally, I will use these “From The Heart” pages to write down things my children say that I want to remember. I like having the freedom to be creative on these pages. AS A THANK YOU, THIS JOURNAL IS FREE THROUGH MONDAY, NOVEMBER 26TH! DOWNLOAD HERE. Daily Bible Study pages with places for you to write the Scripture you are studying, what you want to pull from that passage, how you can apply the passage to your life. Pages to write your favorite verses or verses you want to memorize. Praise pages to record answered prayers. Bible study or Sermon note pages. From The Heart blank pages to illustrate your faith, doodle, take extra notes, or use for any creative outlet. This journal is UNDATED so you can use it any time of the year. Print out as many pages as you need, as many times as you’d like. If you print it as is, you will have a few pages of each different page. You have this printable journal forever! I recommend printing the cover on cardstock or laminating it. You can hole punch your journal and use a binder or take it to get spiral bound. I PRAY THIS JOURNAL BLESSES YOU AS IT HAS ME. I love Bible Journaling. I have years of them. They are my go to books when I need to remind myself of how far I’ve come. Journaling scripture is one of the best ways to start my day feeling empowered and refreshed! This journal looks absolutely gorgeous! This resource looks great!! Definitely needed for busy moms! I love this! I just started utilizing Scripture-writing plans as part of my morning Bible time. Things like this journal are just what women need right now!